Here’s how AlphaDow traded some of the biggest mutual funds in Canada over the past ten years. 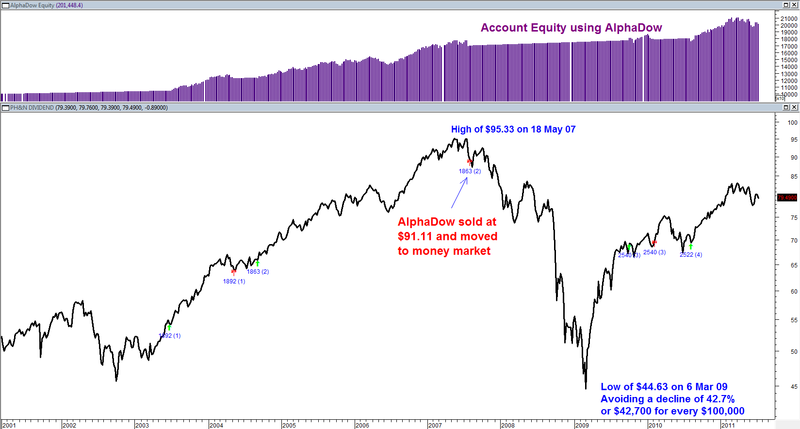 You can overlay AlphaDow on your existing funds by switching to money market fund when AlphaDow is on a SELL signal. Send an email to info@alphadow.com for more details on how to do this. Our latest update chronicles the ups and downs of one of the oldest and most reputable Investment Counselors in Canada. As you can see from the chart below, the bear market of 2007-2009 did not spare this blue chip behemoth. In fact, if you were a buy and hold investor during this period, you watched your account erode by almost 44% in value. That means that an account that was worth $1,000,000 in May of 2007 went down to as low as $560,000. I know of more than a few people who actually suffered through this white knuckle ride. Wouldn’t it make sense to at least have this information available to you BEFORE the next big drop? Email us right now at info@alphadow.com for a complimentary report just like this on your existing mutual fund and stock holdings. Canada’s 2nd largest investment fund, the $14 billion dollar Dividend Fund (from the blue bank) lost almost half of its value in the crash of 2008-09. 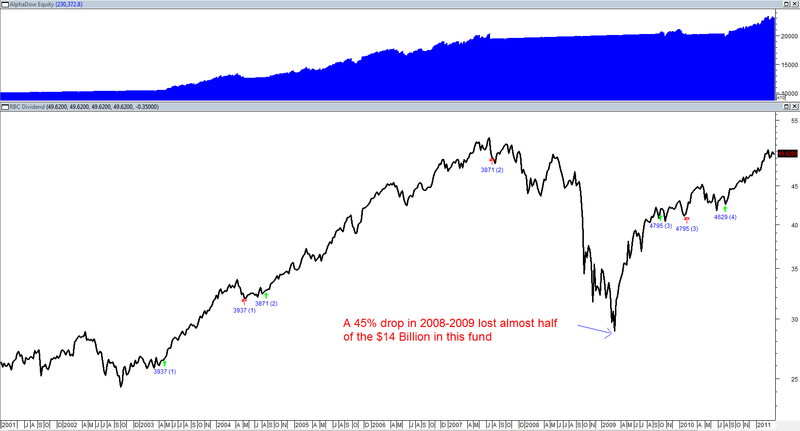 In fact, the fund dropped from a high of $52.23 on July 20th, 2007, to a low of $28.88 on March 9th, 2009, putting investors through a gut wrenching 46% drop in value.